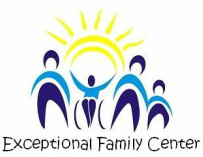 Exceptional Family Center was founded in 2007 by a group of parents and professionals who recognized the need for a center that is culturally sensitive to the unique needs of our diverse community. Our center was created with the intent to provide families of children with a developmental disability with the tools and resources that they need to help their children succeed. What began as an annual conference soon turned in to a center that, today, assists over 300 families by providing them with services that target their specific needs. As of 2013, Exceptional Family Center has proudly established its status as a 501(c)(3) non-profit organization. Grace is the mother of two children with developmental disabilities. She is a graduate of Arc of California Partners in Policymaking, and is the former board president of the Kern Regional Center, former board delegate of the Association of Regional Centers, and a former member of H.E.A.R.T.S. Connection Family Resource Center. Grace is also the co-founder of Aspire Affordable Housing and is a collaborative partner of the Dolores Huerta Foundation. The love that Grace has for her children, and the challenges that she has overcome, gives her the passion and determination to become a community advocate for parents of children with developmental disabilities. With over 30 years of experience working with the developmentally disabled population, Virginia is an asset to our community. She served as director of Client Services at Kern Regional Center and held other positions, some of which include Associate Chief Counselor, Program Manager, Assessment Coordinator, Program Manager, and Service Coordinator. She participated in Grass Roots day in Sacramento, and was the first in Kern County to form “Padres a Padres” - a group of Spanish-speaking parents who met regularly and traveled annually to USC to attend the Fiesta Educativa Conference. Vivian has over 20 years of experience working with individuals with developmental disabilities. Throughout her career, she has developed a number of programs and activities for clients and their families. Vivian has provided direct services for adult clients and has coordinated independent living programs. Additionally, Vivian has conducted IEP training, parent advocacy training programs, and is responsible for implementing and coordinating educational conferences for parents of children with developmental disabilities. Her passion for helping parents of children with developmental disabilities developed while working with H.E.A.R.T.S. Connection.